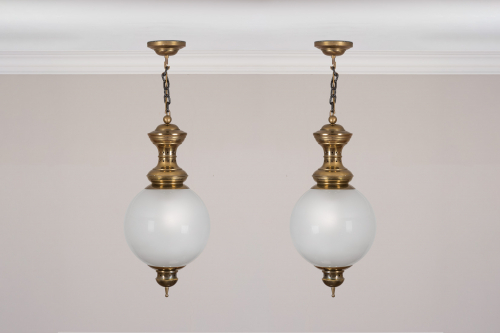 Pair of lacquered brass lanterns by Dominioni, a leading post-war Italian architect and designer. The glass globes measures 28 cm high by 30 cm wide. The lights including the frame measures 64 cm high. The chain and ceiling rose measures 26 cm - though this can be lengthened or shortened as required.